Back in December, I had the chance to go to the Cessna Factory in Independence, KS to receive my Cessna FITS Accepted Instructor training. Now, the city of Independence isn’t much to write home about, but the experience I had at the factory sure was top notch. I encourage Cessna owners everywhere to fly over to Independence and take a tour of the factory. You won’t regret it. Here’s a little bit about my experience. Boy, if I thought the Cirrus factory in Duluth, MN was a pain to get to, once I started booking travel to Independence, Duluth seemed like a dream. Unless you are flying your own airplane into KIDP, the trip is a little bit of a bear. The two options for where to fly into commercially are Tulsa or Wichita. I guess you could throw Joplin, MO on there as well. I flew into Tulsa (thankfully it was a direct flight; unfortunately, it was delayed by 4 hours). After grabbing my rental car, a spiffy Dodge Dart, I was off on the 2 hour drive north to Independence. The drive isn’t too bad, especially with some good company or good music. I’ve had much worse. Don’t be expecting the Ritz-Carlton when arriving in Independence. It may have been the start of the trek west for settlers back in the 1800s, but that doesn’t translate to swanky hotels. I was in the Microtel, which was the highest recommended by all I spoke with. I was pleasantly surprised. It wasn’t too shabby. Again, not the Ritz, but for the Kansas plain, not bad. Now, to preface this, my training was specifically for the CFAI+, so someone going for factory training when picking up a new airplane, your experience will be a little different. All Cessna’s courses are 3 day courses. Mine was no different. We did ground in the morning and flew in the afternoon. 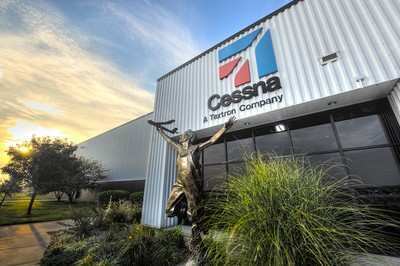 Everybody at the Cessna factory was great. Donna, the secretary, treats you great. She takes care of everything for you the moment you walk out of the elevator (PS, the training department is upstairs on the second floor). She makes you feel like family. She answered all my questions and pointed me in the proper direction for everything. Jeremy Schrag was my ground instructor. He was a blast to work with. The focus of the CFAI+ ground school is in how to teach the factory transition course the proper way, how to plan it out, things like that. He was very thorough and had some good stories to throw in there as well. Al Rice was my flight instructor. He is a very good flight instructor. The first flight, I was put through my paces with the G1000 in the C206. He threw almost everything but the kitchen sink at me. We were warned that the first flight would be like a check ride to check our G1000 system knowledge. They weren’t kidding! A nice thing of Braum’s ice cream helped cool my brain off afterward (in town, not at the factory, unfortunately). The second day was in the simulator and I got to play instructor while Al demonstrated common student mistakes. The third day consisted of teaching failures the proper way. I got a factory tour on the second or third day. We got done with ground school a little early and Jeremy showed us around on the factory floor. It was really cool to see the different airplanes in their different stages of manufacture. When they say the airplane is on the line, they literally mean a line. I got to see the new Corvalis TTX being put together as well as the 172, 182, 206, and the Citation Mustang. Very cool to see how it is all done. I think the folks at Cessna may have a mutual understanding to make people feel like family when they leave. Even if they don’t have that motto officially, they certainly did that with me.